Monday’s ad is by the Brewing Industry Foundation, from 1945, part of a series of ads the beer industry undertook just as World War 2 was ending, after their “Morale is a Lot of Little Things” series. They were also a precursor to the “Home Life in America” series that was numbered (and which I’ve featured before), and very similar. 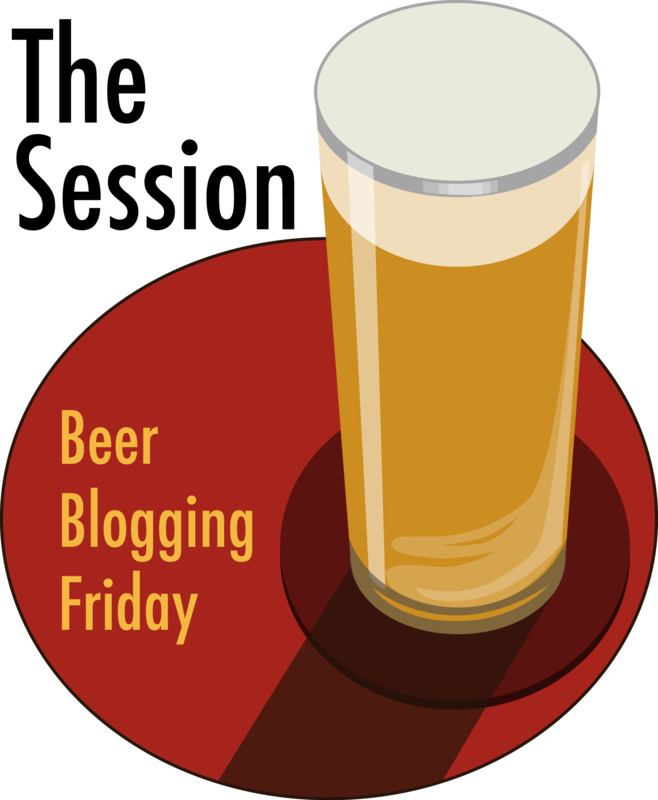 Each ad featured an original illustration or work of art by prominent artists of the time, along with the first use of the “Beer Belongs…enjoy it!” tagline. 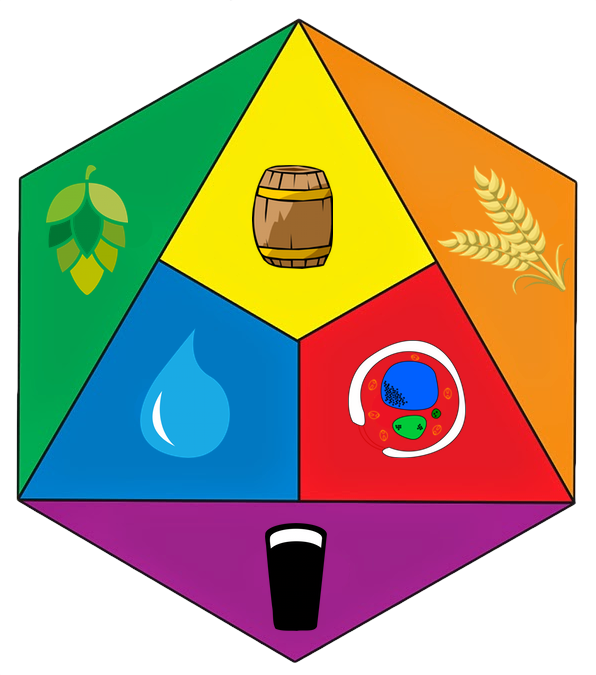 It’s also when the UBIF started using “America’s Beverage of Moderation” in their advertising. 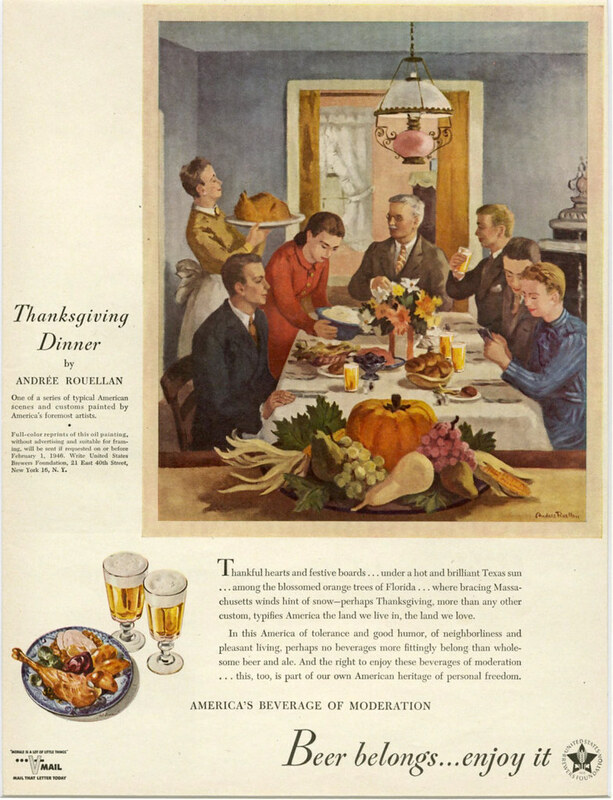 In this ad, entitled “Thanksgiving Dinner,” the scene shows the start of a family’s Thanksgiving dinner, with the turkey and all the fixin’s, including beer. The painting was done by Andrée Rouellan, who was an “American artist whose realist work has modernist overtones and commonly depicts everyday scenes in American South and New York City” from New York. 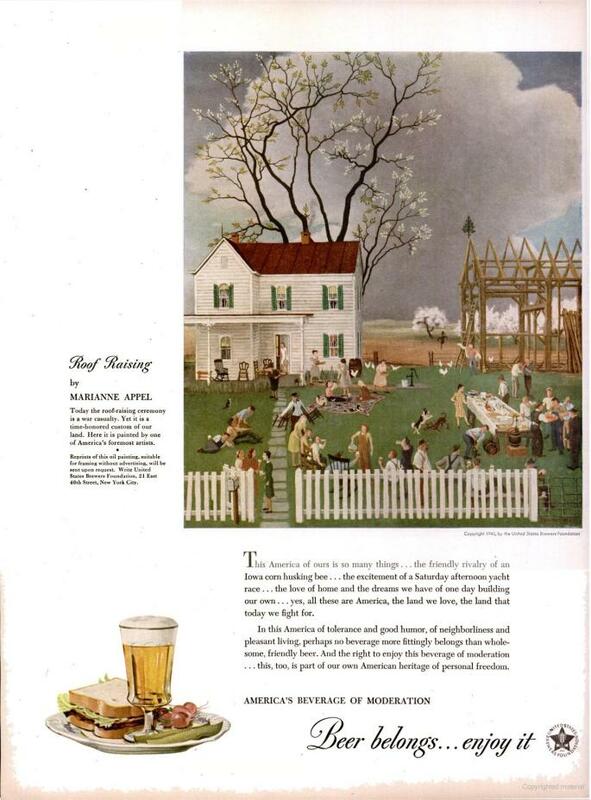 Sunday’s ad is by the Brewing Industry Foundation, from 1945, part of a series of ads the beer industry undertook just as World War 2 was ending, after their “Morale is a Lot of Little Things” series. They were also a precursor to the “Home Life in America” series that was numbered (and which I’ve featured before), and very similar. 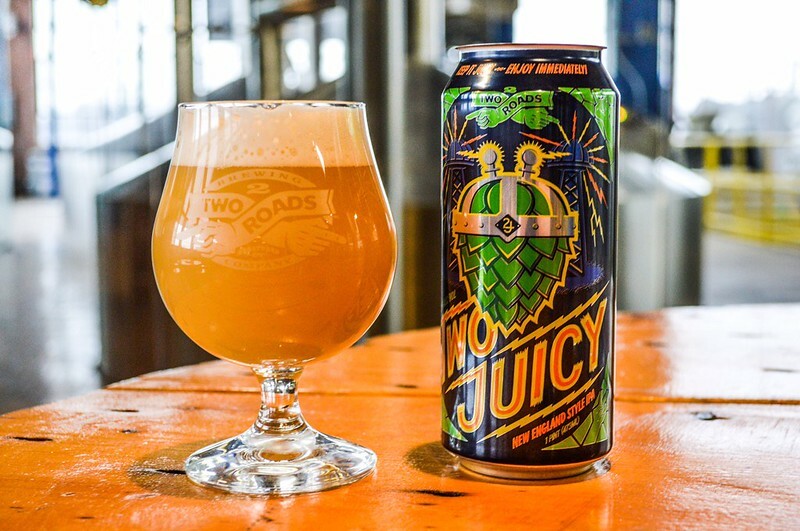 Each ad featured an original illustration or work of art by prominent artists of the time, along with the first use of the “Beer Belongs…enjoy it!” tagline. It’s also when the UBIF started using “America’s Beverage of Moderation” in their advertising. 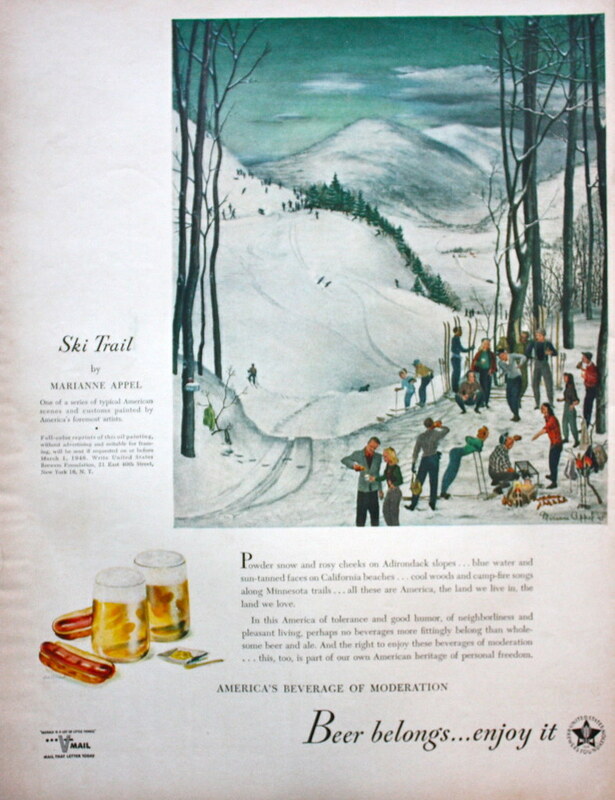 In this ad, entitled “Ski Trail,” the scene shows a winter scene on the ski slopes, where a large group has taken a break from skiing and is cooking hot dogs and drinking beer. The painting was done by Marianne Appel, who was an “American artist and a member of the Woodstock artists colony” from Woodstock, New York. Friday’s ad is by the Brewing Industry Foundation, from 1945, part of a series of ads the beer industry undertook just as World War 2 was ending, after their “Morale is a Lot of Little Things” series. They were also a precursor to the “Home Life in America” series that was numbered (and which I’ve featured before), and very similar. 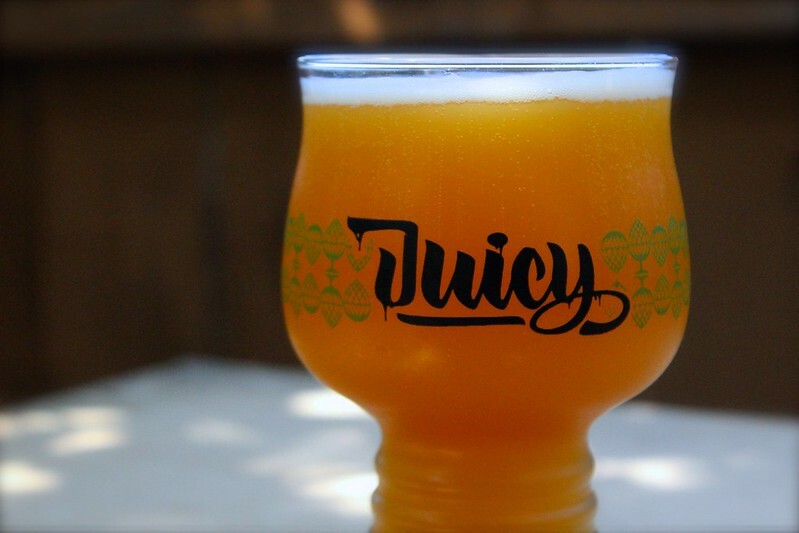 Each ad featured an original illustration or work of art by prominent artists of the time, along with the first use of the “Beer Belongs…enjoy it!” tagline. 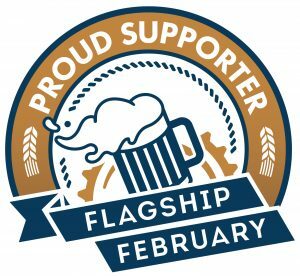 It’s also when the UBIF started using “America’s Beverage of Moderation” in their advertising. 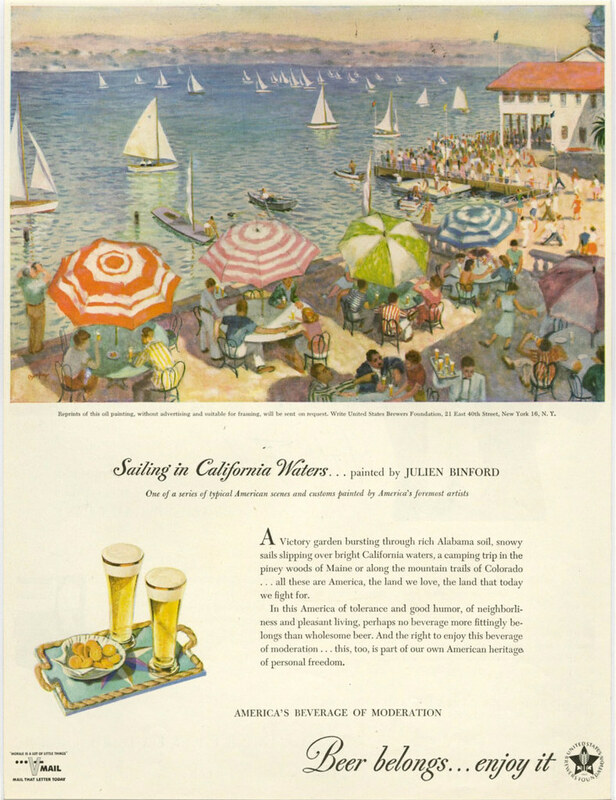 In this ad, entitled “Sailing in California Waters,” the scene shows sailboats filling a Bay in California, with spectators on the shore, some watching and some just eating or drinking beer and enjoying the sunny day. The painting was done by Julien Binford, who was an “American painter known for his paintings of the rural population of his neighborhood as well as for his murals” from rural Virginia. Thursday’s ad is by the Brewing Industry Foundation, from 1945, part of a series of ads the beer industry undertook just as World War 2 was ending, after their “Morale is a Lot of Little Things” series. They were also a precursor to the “Home Life in America” series that was numbered (and which I’ve featured before), and very similar. 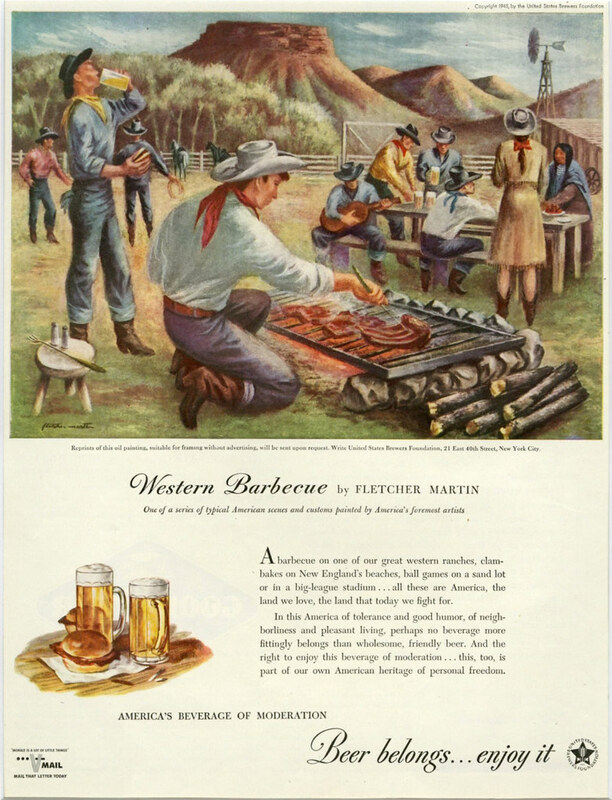 Each ad featured an original illustration or work of art by prominent artists of the time, along with the first use of the “Beer Belongs…enjoy it!” tagline. It’s also when the UBIF started using “America’s Beverage of Moderation” in their advertising. In this ad, entitled “Roof Raising,” the scene shows an entire community coming together for a traditional roof raising. The painting was done by Marianne Appel, who was an “American artist and a member of the Woodstock artists colony” from Woodstock, New York. Wednesday’s ad is by the Brewing Industry Foundation, from 1945, part of a series of ads the beer industry undertook just as World War 2 was ending, after their “Morale is a Lot of Little Things” series. They were also a precursor to the “Home Life in America” series that was numbered (and which I’ve featured before), and very similar. 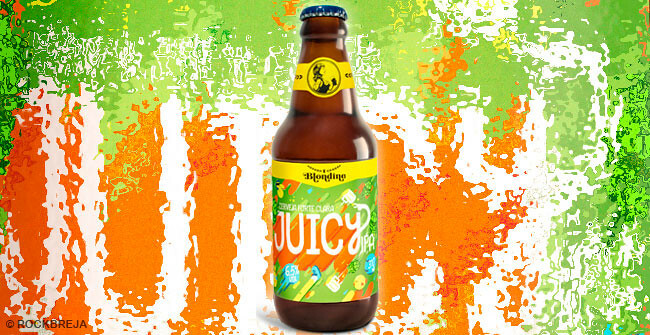 Each ad featured an original illustration or work of art by prominent artists of the time, along with the first use of the “Beer Belongs…enjoy it!” tagline. It’s also when the UBIF started using “America’s Beverage of Moderation” in their advertising. 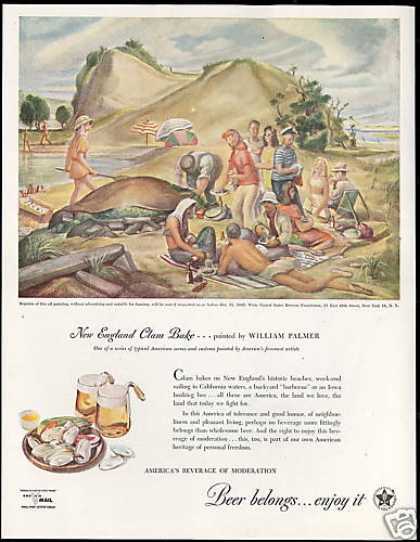 In this ad, entitled “New England Clam Bake,” the scene shows a beach where a dozen people are having a clam bake, complete with many beers. The painting was done by William Palmer, who was an “American painter who created public murals” from Des Moines, Iowa. Tuesday’s ad is by the Brewing Industry Foundation, from 1945, part of a series of ads the beer industry undertook just as World War 2 was ending, after their “Morale is a Lot of Little Things” series. They were also a precursor to the “Home Life in America” series that was numbered (and which I’ve featured before), and very similar. 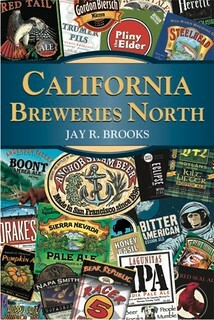 Each ad featured an original illustration or work of art by prominent artists of the time, along with the first use of the “Beer Belongs…enjoy it!” tagline. It’s also when the UBIF started using “America’s Beverage of Moderation” in their advertising. 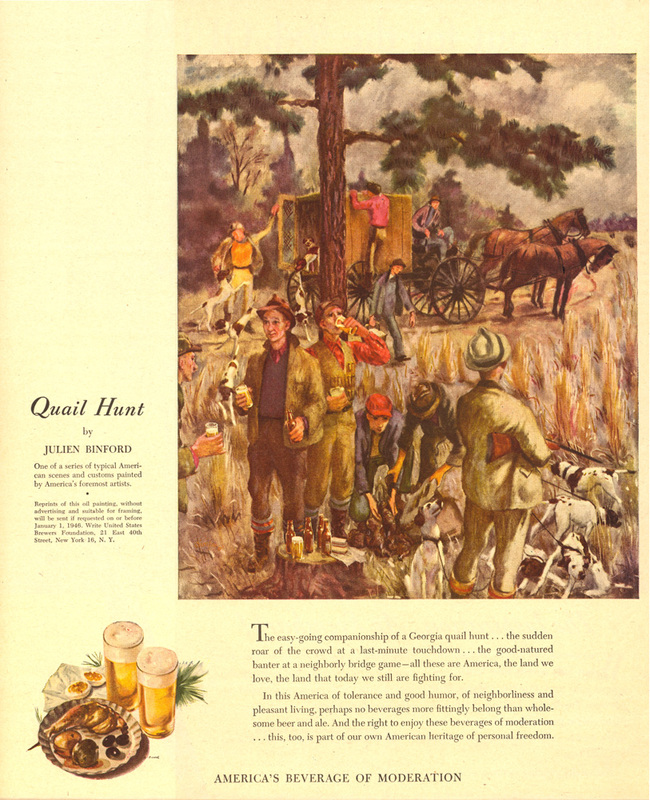 In this ad, entitled “Quail Hunt,” the scene shows nearly a dozen men out in the wilderness for a day of hunting, stopping for some refreshments, which of course was beer. The painting was done by Julien Binford, who was an “American painter known for his paintings of the rural population of his neighborhood as well as for his murals” from rural Virginia. 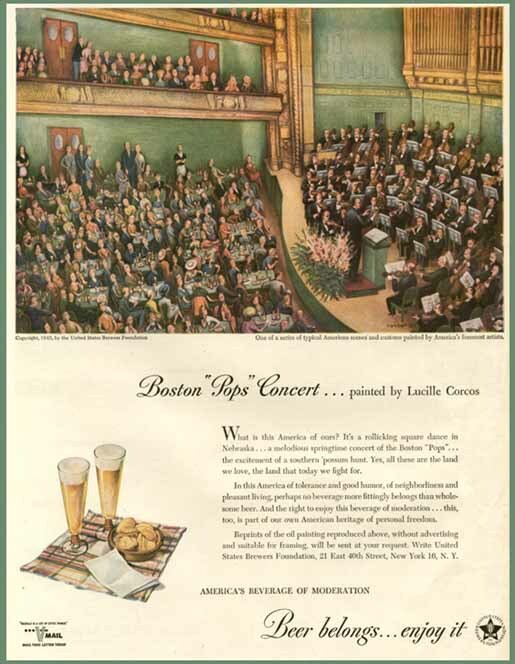 In this ad, entitled “Boston ‘Pops’ Concert,” the scene shows a packed auditorium listening to a concert orchestra on stage. The painting was done by Lucille Corcos, who was an “American painter known for her figurative painting and printmaking” from Aledo, Illinois. 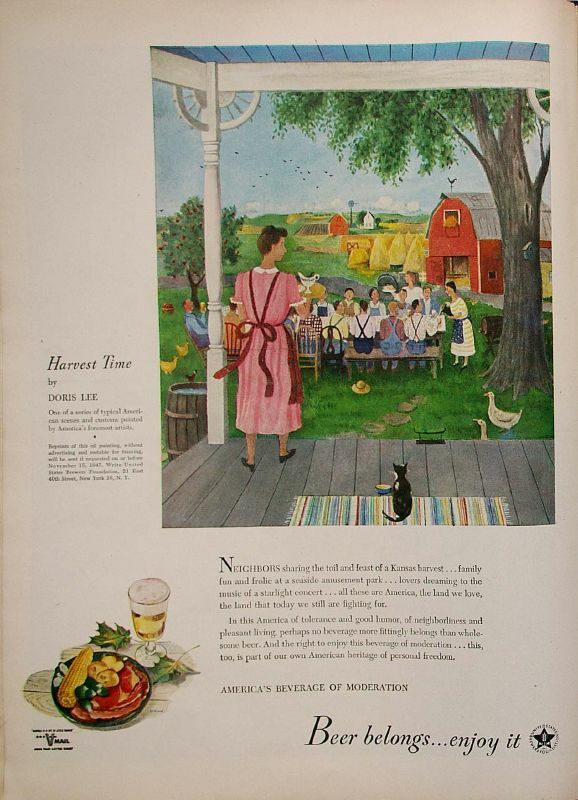 In this ad, entitled “Harvest Time,” the scene is an outdoor dinner on a Kansas farm at harvest time, with the neighbors, too. The painting was done by Doris Lee, who was an “American painter known for her figurative painting and printmaking” from Aledo, Illinois.